As an incentive to conserve water, the water departments in SLO County and the State of California are offering rebates for converting your lawn into a drought-tolerant landscape. The rebate programs across the county are pretty similar, but do vary some. Be sure you read the specifications before your rip up your lawn and start working so that you can be sure to qualify for a rebate. Unfortunately the city of San Luis Obispo is not offering any lawn rebate programs at this time. However, residents of San Luis Obispo can still qualify for state of California’s lawn rebate program, which actually pays out more per square foot than any of the other cities in the county. The state is giving $2/square foot for up to 1,000 square feet of lawn. This means that if you have a lawn that is 1,000 square feet or greater, you’ll get a $2,000 rebate! The state’s program sets aside $24 million and aims to incentivize the removal of 10 million square feet of turf grass! That’s a lofty and admiral goal, but with the trend towards drought-tolerant landscaping that we’ve seen, it’s suggested that you act quickly to convert your lawn before the rebate money is all gone. You can find more info and apply for your rebate HERE. P.S. Go to this link to see the latest information from the City of San Luis Obispo concerning the drought. Just like SLO, Los Osos doesn’t have a city rebate program. If you have a lawn in Los Osos, you will need to go through the state’s lawn rebate program to get $2/sq. ft up to $2000. See above for the details on that. This San Luis Obispo landscape qualified for a $2,000 lawn conversion rebate from the state. The city of Morro Bay’s Cash for Grass rebate program offers residents 50 cents per sq. ft with a minimum of 200 sq. feet of turf removed. The maximum rebate is $500 for 1,000 sq. feet or more. To get your rebate you need to first fill out an application which can be found HERE. In order to qualify, you need to live within city limits, have a utility account in good standing, and remove a minimum of 200 sq. feet of lawn. In addition, your existing grass can’t be dead, it needs to be maintained and have a working sprinkler system. This is presumably to keep people who just have a dirt lot from cashing in on the rebate. The converted area must include a drip irrigation system, 2-3″ of mulch, and the new plants must cover at least 50% of the area once mature. If using synthetic turf, it needs to be made of polyethylene or nylon, have a 5 year warranty, and not encroach on any living plants. The process involves a pre and post inspection to verify compliance. After post inspection, a refund check will be issued to the homeowner. You must be an existing customer of the City of Paso Robles and you must also get a pre-installation inspection. Call 805-227-7250 to schedule this inspection. The project must be completed within 120 days of the pre-installation inspection. Your lawn must be replaced with drought-tolerant plants and any uncovered area must be covered with a 3 inch layer of mulch, rock, or seeded with native drought-tolerant grasses. Materials in hardscape areas must be decomposed granite or permeable pavers. Lawn sprinkler heads must be reduced in number, removed, or capped. Also, be sure you keep all of your receipts because they must be provided at the post-installation inspection which you will schedule when the project is finished. The rebate you will receive will either be 50 cents per square foot, or the cost incurred, whichever is less, with a cap at $500. Checks will be mailed within 30 days of post-inspection. 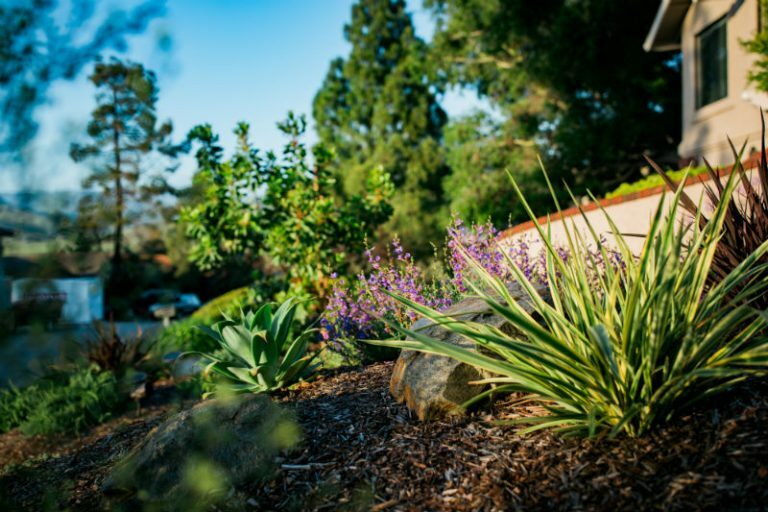 Atascadero’s water department requires that you convert your lawn to drought-tolerant plants, synthetic turf, or permeable paving to receive a rebate. The existing lawn must be in good condition, and irrigated by a sprinkler system in good working order to qualify. The rebate is 25 cents per square foot for a maximum of $500 for a single family residence and $1000 for a multi-family residence, or commercial property. An additional rebate of $100 is offered if you replace conventional irrigation controllers with ones that use local weather based sensors. The equipment must be pre-qualified by water conservation staff in order to receive the rebate. To schedule a pre-inspection call 805-464-5347 or email jhendrickson@amwc.com. If you qualify after the pre-inspection, Atascadero Municipal Water Company will initiate a rebate application and once the application is submitted, you must complete your turf conversion project within 120 days. Once your project is finished call AMWC for a post inspection. If you have replaced your controllers with the type that have weather based sensors be sure to show the inspector your receipts. Rebates over $150 will receive a check within 10 days of the post inspection. Rebates of $150 or less will be credited to your account. Turf conversion award won by Greener Environments for an Atascadero lawn removal. Templeton has gotten a little more clever with their water conservation incentive and created a conversion beauty contest as well as a three tiered rebate program including bronze, silver, and gold. Bronze-If you replace your garden sprayers with drip lines you can receive $10 per sprayer with a minimum of one sprayer replaced and a maximum amount of $100 in rebates. Silver-Replace lawn and sprinklers with drought-tolerant plants, rock, or artificial turf and drip irrigation for 25 cents per square foot with a minimum of 200 square feet converted and a maximum rebate amount of $500. You can choose to participate in the conversion beauty contest as well and the winner will be featured in an article in Templeton Matters. Applications can be submitted to the main office at 420 Crocker St. in Templeton or electronically to khix@templeton.csd.org. Call 805-434-4900 for any questions. Applicants must be in good standing with their water account to participate. You must schedule a pre and post conversion site visit with a TCSD representative. The project must be completed within 120 days of the application date. Arroyo Grande is offering $1 per square foot of lawn removed with a minimum of 500 sq ft and a maximum of a $5,000 rebate for 5,000 sq ft removed. You must first submit an application by calling Kelly Heffernon at 473-5420 to schedule a pre removal verification. Your lawn must still be alive at the time of the pre removal verification in order to qualify, so if you have already turned off your water and your lawn is brown you will not qualify. Conversions must be completed within 6 months of agreement and then undergo a post removal inspection verification before receiving your rebate. Lawns must be replaced with drought-tolerant plants, permeable mulch, or artificial turf. Converted areas must have at least 50% living plant coverage when plants are fully grown. Mulch must cover 2”-3” and must be permeable to air and water. Artificial turf has to be installed by a licensed contractor, be polyethylene or nylon, and have at least a 5 year warranty. Sprinklers are to be replaced with drip irrigation with a pressure regulator, filter and emitters. Each drip emitter must be rated at less than 20 gallons per hour. Applicants are required to remain in compliance with programs terms and conditions for a 5 year period following the rebate or the applicant may be required to refund the entire rebate. Grover Beach is giving rebates of $1 per square foot with a minimum of 100 sq ft and a maximum of $750 per household. As with all the other programs a pre inspection and post inspection are required. The lawn to be converted must have been maintained for the last 12 months. Lawn must be replaced with drought-tolerant landscaping and watering systems must be replaced with a low volume drip irrigation system equipped with a pressure regulator, filters, and emitters. The drip emitters must be rated at less than 20 gph. 2”-3” of mulch must be used with no ground exposed. All materials must be permeable to air and water. Projects must be completed within 6 months of the pre conversion inspection. Call 805-473-4520 for further questions or go to this link to fill out an application. Lawn converted into colorful drought-tolerant plantings in San Luis Obispo. Even if you are in a city with a turf replacement program, you can still apply for an additional rebate from the state. That’s great news if you have a large lawn and have exceeded your cities maximum rebate! With climate experts predicting long term trends of dry weather in our state, it’s time to reconsider the way our neighborhoods look. Even with a healthy dose of rain this past winter, the fact remains that we live in a dry region and must use water responsibly. More than half of outdoor water use is spent on lawns. Every lawn that is converted to water-wise landscaping edges us closer to a more sustainable California. 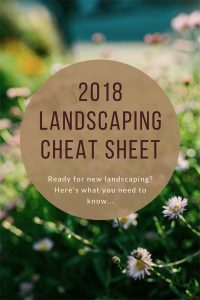 The good news is that converting your lawn to low-water landscaping means you can have a beautiful new yard filled with interesting and colorful plants. Not only that, but your water bill will plummet and maintaining your landscape will be easy and affordable. No more chasing a mower or having to pay someone else to do it! We must all do our part to save water and these rebate programs make it a little bit easier on us. Remember that the rebate programs last for only as long as there are funds to support them, so be sure to get your applications in now before its too late. If you need help with removing your lawn, designing a new landscape, or have any questions, don’t hesitate to contact us.